Your holiday in Amsterdam usually starts at Schiphol Airport. You will of course want to head to your hotel or to the centre of town in the best possible way. If you wish to make the trip on your own, please go to our public transport page. Tourist Shuttle Amsterdam offers a friendly shuttle service which will ensure a smooth start to your holiday. We will be happy to take you safely from Schiphol Airport to your destination in Amsterdam. We will wait for you at the airport meeting point, in the main hall, from 20 minutes after your arrival until 1 hour after arrival. We will carry a sign with your name. 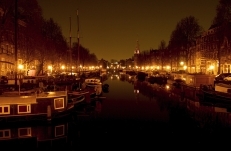 These prices include meet & assist service and transfer to your hotel in Amsterdam. • It is possible to organize transfers from Schiphol Airport to other destinations in The Netherlands or in Europe. If you have a problem receiving your luggage please call us at: + 31 (0)612311081.